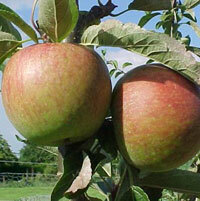 Fiesta is a new late season apple, raised by the East Malling Research Station. A cross between Coxs Orange Pippin and Idared, this excellent new variety is ready for picking late September/October and will easily store right through until late spring, or even longer. In Ministry of Agriculture trials, in temperature controlled storage, it has been stored as late as early August. The medium to large sized fruits are pale yellow, with a bright red flush, and the flesh is firm, white, crisp and juicy. The flavour is quite superb. Fiesta is very easy to grow in all areas, very heavy cropping and very free flowering, a superb garden variety. Ideal pollinators include: Redsleeves, James Grieve, Grenadier, Greensleeves etc. Very highly recommended. All trees £1.00 extra to normal price.